When it comes to looking for kitchen gadgets to serve as gifts, it can be pretty hard to decide on what to give. The hidden gizmos that populate the kitchen cupboards of those that we know and love can be pretty hard to divine. Luckily there is usually something that every kitchen can use, and yet most kitchens don’t have: stone. Well, stoneware to be exact. This Petit Dejeuner Juicer, priced at $24.00, would make for an excellent gift for those that have everything (in the kitchen). 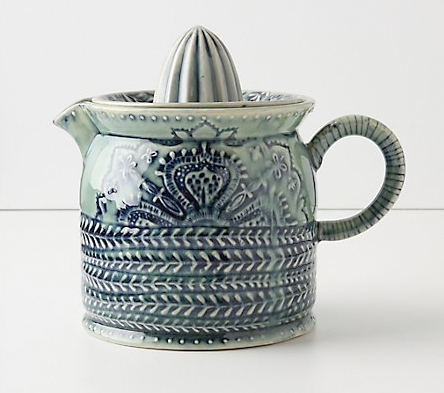 Simple and sturdy, yet elegant, the 32-ounce container acts as both juicer and pitcher. 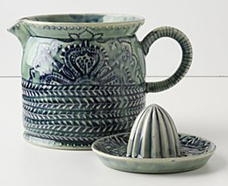 Detailed with “braids and buds”, the 5-inch tall blue ceramic piece is even microwave-safe.